Denis Lotoev was born in 1974. He started to learn conducting from professors Givi Azmaiparashvili and Vladislav Chernushanko when he was still a student of a musical school in a violin class. In 1991 he became a student of St.Petersburg State Conservatoire (Prof. Chernushenko’s class of opera and shymphony conducting). 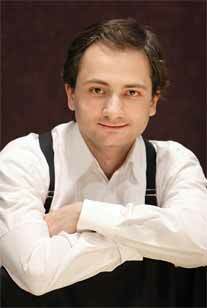 In 1998 he graduated from its post-graduate school.His debut with the Tchaikovsky Symphony Orchestra was in 1996 and in 2000 he became Vladimir Fedoseyev’s assistant. Before this important period in his creative life he had intensively worked in different musical genres and with different musical collectives: he participated in the opera performances of “Eugene Onegin” and “Iolanta” by Tchaikovsky, “Tsar’s Bride” by Rimsky-Korsakov and “Faust” by Guno in the Opera and Ballet Theatre of the St.Petersburg Conservatoire, he cooperated with the Symphony orchestra of the St.Petersburg State Academic Quire, St.Petersburg State Academic Orchestra, Symphony Orchestra of the St.Petersburg Conservatoire, Georgya’s Symphony Orchestra of Radio and Television, the orchestra of the Tomsk Philharmonic Society. Work with the Tchaikovsky Symphony Orchestra was a new stage in the conductor’s creative career. Denis Lotoev was before the conductor’s stand of the country’s oldest collective when it performed in the Great Hall of the Moscow Conservatoire, at charity parties of the Concert Studio of the House of Music. The programmes included compositions by Mahler, Motzart, Salieri, Brahms, Sederline and Shostakovich. Every year Denis Lotoev with Tchaikovsky Symphony Orchestra taking part in the series of concerts of Moscow Filarmony “Stars of the XXI century”. This concerts with young musicians: Alexandr Buzlov (cello), Rem Urasin (piano), Alexandra Melnikova (piano), Denis Shapovalov (cello), Alexandr Corbina (piano), Ekaterina Frolova (violin), attracted attention of cultural workers and a large number of music-lovers. Denis Lotoev continues to master his art. In October 2005 he was heading the Tchaikovsky Symphony on its tour in the Urals (Magnitigorsk, Tchelyabinsk, Kurgan). Russian press noted him as a commendable professional, a bright interpreter who thinks unordinary and who knows how to fascinate the audience with a sincere emotion and a fresh interpretation of the score. In October 2008, during the tour of the Tchaikovsky Symphony Orchestra in Latin America, he successfully presented a Russian music porgramme in Montovideo (Uruguay), Rosario, and Sao-Paolo (Brazil).